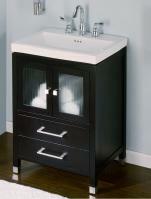 A small bath space can also be an elegant bath space, especially when you incorporate this 24 inch vanity set. 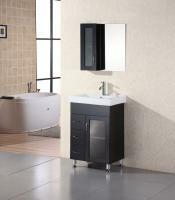 The espresso cabinet features a closed storage space and a small open shelf at the bottom. The integrated white sink provides a stylish contrast and you also get the matching mirror for a complete look on your wall.